A Real Simple Best Book of 2019. A New York Times Book Review New and Noteworthy Book. A People Magazine People Pick. The only contemporary book about what it’s really like to be in college. An unprecedented fly-on-the-wall look inside fraternity houses from current brothers’ perspectives—and a fresh, riveting must-read about what it’s like to be a college guy today. Two real-life stories. One stunning twist. Meet Jake, a studious freshman weighing how far to go to find a brotherhood that will introduce him to lifelong friends and help conquer his social awkwardness; and Oliver, a hardworking chapter president trying to keep his misunderstood fraternity out of trouble despite multiple run-ins with the police. Their year-in-the-life stories help explain why students are joining fraternities in record numbers despite scandalous headlines. Investigative journalist Robbins takes readers on an eye-opening tour of contemporary college fraternities. Highlighting the changing roles and unique pressures millennial males are currently facing, Robbins recounts a year in the life of two committed fraternity brothers…. Her energetic prose and dramatic insider’s perspective will keep readers both captivated and well informed. An essential read for parents and students. I truly believe that Alexandra Robbins is the greatest non-fiction author of our time. By focusing her writing on the subjective narratives of “characters” who appear as case studies, her books read as novels with critical analysis essays interspersed throughout. Her craftsmanship is unparalleled. I appreciated this book for its perspective – and for what I know will challenge mainstream audiences to think more deeply about masculinity. Skillfully paced. 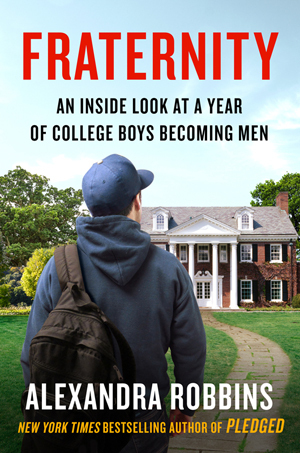 This engaging behind-the-scenes account of fraternities, their traditions, and how they influence (a certain strain of) American men will interest college-bound students, their parents, and readers contemplating American culture. As always, her writing and storytelling is wonderful and research insightful… I could not put this book down. Alexandra Robbins… spent a year documenting Greek life for her excellent new book, Fraternity…. Robbins makes the case that fraternities are not monolothic and that, done right, they can be healthy spaces. Compelling profiles of men navigating the processes and pressures of rushing, pledging, and troubleshooting the hypermasculine fraternity culture and the rigid guidelines of collegiate social engagement…. Much of the material will be useful and informative for college-prep students and their parents (a final section provides advice for both groups). Real-life perspectives on the immersive, unifying, and chancy culture of fraternities.